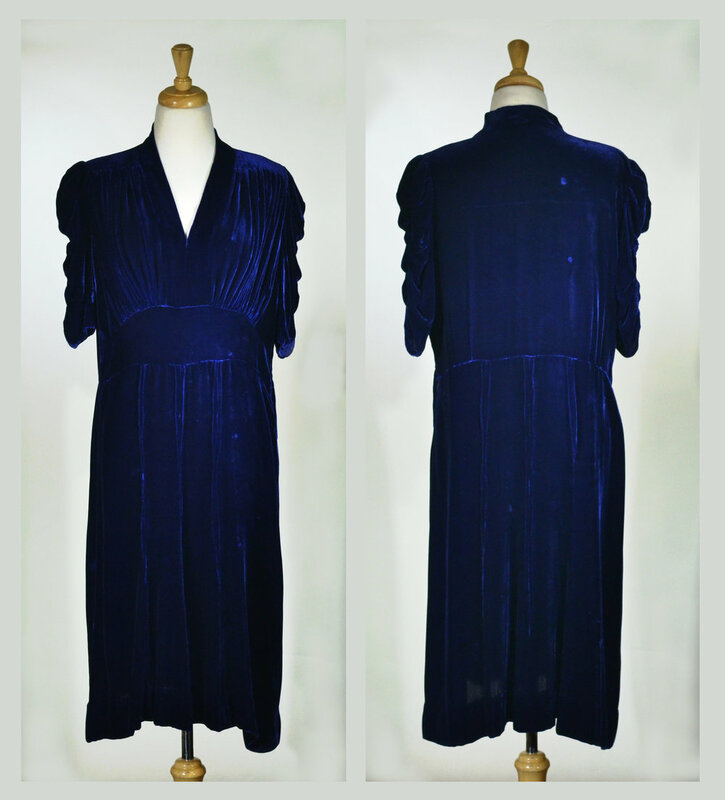 Please scroll down for images of the 1930s Silk Velvet and Rayon Dress shown in greater detail. Material: Silk velvet and rayon. Colors: Sapphire. This color was not the easiest to photograph, so please note that it is actually a bit darker than shown in the close-up photos below. I specifically used bright lights to show the flaws in the piece, so the blue appears brighter than it actually is. It's a lovely deep blue hue, most accurately shown in images in which I'm (Jenn) modeling it. Closure: Single side metal zipper. As you can see from the Good rating above, this beautiful - and quite old - dress has seen some action in its day. The structure is in EXCELLENT condition, with only a single hand repair made to the waist seam (see picture below); however, as you'll read, there are issues of note. There are multiple fabric flaws throughout the piece, many pictured below. The largest grouping of flaws is on the back of the skirt, near the back of the right knee area. The back, left sleeve has very slight discoloration. 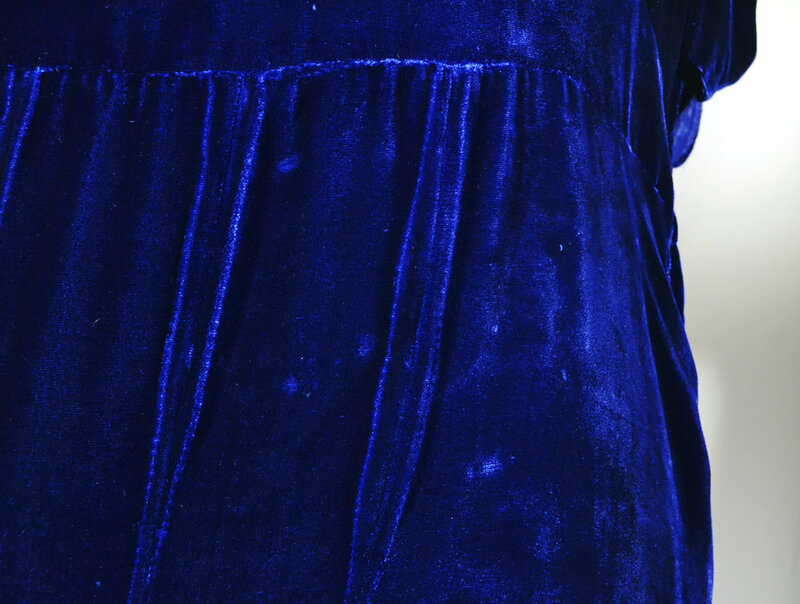 As mentioned above, the dress is a darker shade of blue than certain pictures may appear, those images taken under bright light so as to better show flaws. That said, only when the light catches the dress in a particular way can the flaws be seen. This piece has been priced accordingly, so if you are seeking a lovely 1930s dress that is not pristine, but certainly wearable and unquestionably stylish, then this baby may be for you! Tag, located inside center, near the back of the neck. Ruching detail on the right sleeve. 1/2" flaw on back, right shoulder. Flaw on back right shoulder. Examples of fabric flaws on skirt area. Minor hand repair made to waist seam. Bodice detail, notice the minor fabric flaws. Minor discoloration, back of left sleeve. Flaws on front of skirt area.